Wading through various ancient texts in search of the hydraulic engineering projects of Hercules, aka Herakles, may seem like a rather boring, academic challenge – especially since there are far more exciting feats that have flooded the imaginations of Hercules’ cult followers throughout the ages. Additionally, tracking Hercules’ sodden footsteps across the vast and shipwrecked shores of ancient Greek mythology turns quickly into a storm-soaked literary fishing expedition. There’s little consensus on the life and legends of Hercules, or, for that matter, any other ancient Greek heroine or hero. There is, however, plenty of exciting reading material from famous writers throughout the ages, including Homer, Hesiod, Stesichorus, Pindar, Aeschylus, Herodotus, Diodorus Siculus, Pausanias, Ovid, Virgil, Seneca, etc., etc., etc. This post doesn’t attempt to cover all the labors of Hercules, or even itemize all of his hydraulic heroics. But, by combining bits and pieces of Hercules’ legends with recent archaeological evidence, it does offer a rich and tantalizing glimpse into the life and times of Mycenaean people far removed from the warriors who battled at Troy. Finding physical evidence of ancient hydraulic projects dating from the Mycenaean civilization in ancient Greece is pretty spectacular. This ancient evidence, recently analyzed in Boeotia, has opened a whole new window on the prehistoric power and technological expertise of the ancient Greeks. Through this window, we are finding more physical evidence of truth in the myths of widespread Mycenaean power and prowess, and even more light is shining on the administrative and logistical elements of everyday life in the many Mycenaean palace complexes. Heinrich Schliemann is surely smiling. We also gain a new perspective on the legendary feats of Hercules from this new window, especially tasks in which he is credited with diverting the waters of rivers, lakes, and oceans. Originally published on the website Novo Scriptorum, the guest post below presents portions of two academic papers outlining and analyzing the physical evidence of Mycenaean hydraulic engineering projects in Boeotia. My interest was captured because of a reference to a legend of Herakles tied to this location. In this case, Herakles is credited with a great feat of hydraulic engineering in order to destroy the work of an earlier (or perhaps a rival) hydraulic engineer who had drained the plain of Orchomenos to gain more farmland. Re-diverting the Cephisos river back to the plain, Herakles floods the crops and then burns the palace of Orchomenos to the ground. 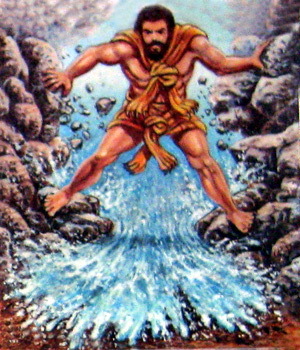 In the course of his legendary labors, Heracles is credited with many similar feats of hydraulic engineering by diverting waters from their current courses for various purposes. Several of these feats are summarised nicely by Diodorus Siculus, a Greek historian from Agyrium in Sicily (ca. 80–20 BCE), in his Library of History. 5 consequently, whereas before that time a great space had stood between them, he now narrowed the passage, in order that by making it shallow and narrow he might prevent the great sea-monsters from passing out of the ocean into the inner sea, and that at the same time the fame of their builder might be held in everlasting remembrance by reason of the magnitude of the structures. Some authorities, however, say just the opposite, namely, that the two continents were originally joined and that he cut a passage between them, and that by opening the passage he brought it about that the ocean was mingled with our sea. On this question, however, it will be possible for every man to think as he may please. 6 A thing very much like this he had already done in Greece. For instance, in the region which is called Tempê, where the country is like a plain and was largely covered with marshes, he cut a channel through the territory which bordered on it, and carrying off through this ditch all the water of the marsh he caused the plains to appear which are now in Thessaly along the Peneius river. 7 But in Boeotia he did just the opposite and damming the stream which flowed near the Minyan city of Orchomenus he turned the country into a lake and caused the ruin of that whole region. But what he did in Thessaly was to confer a benefit upon the Greeks, whereas in Boeotia he was exacting punishment from those who dwelt in Minyan territory, because they had enslaved the Thebans. A few additional notes are included here, as they help provide more context for the following guest post. I. As seen in the map above, the Mycenaean civilization was vast. 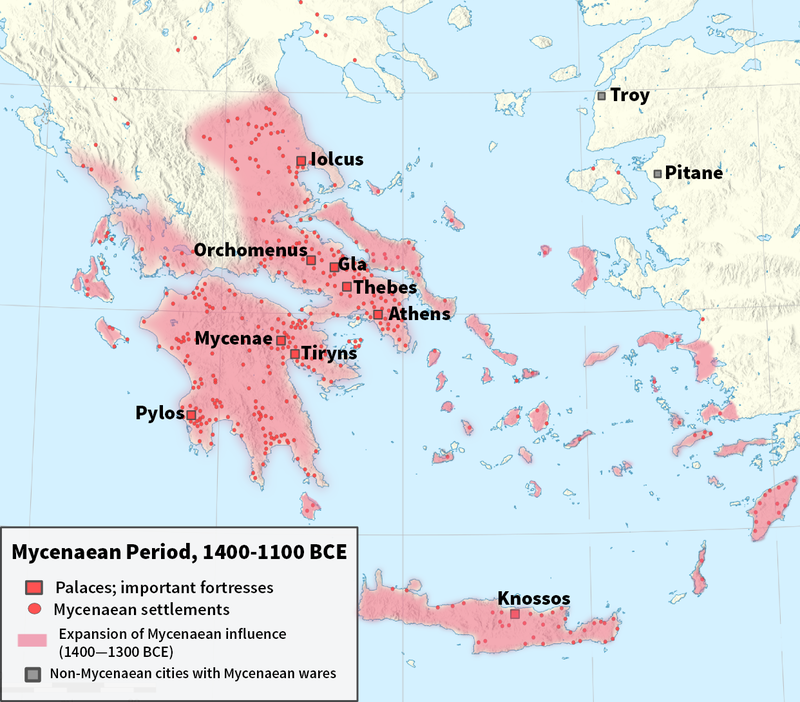 Roughly dating from 1600-1100 BCE based on archaeological evidence, it consisted of prominent centers of power throughout ancient Greece, primarily Mycenae in the Argolid region of the Peloponnese; Pylos, Tiryns, and Midea (also in the Peloponnese); Orchomenos, Thebes, and Athens in Central Greece; and Iolcos in Thessaly. Mycenaean and Mycenaean-influenced settlements have also been found in Epirus and Macedonia, as well as on Crete, Cyprus, and other Mediterranean islands, on the coast of Asia Minor, in the Levant, and in Italy. Seven stades from Orkhomenos [in Boiotia] is a temple of Herakles with a small image. Here is the source of the river Melas (black), one of the streams running into the Kephisian Lake. The lake at all times covers the greater part of the Orkhomenian territory, but in the winter season, after the south-west wind has generally prevailed, the water spreads over a yet greater extent of the territory. The Thebans declare that the river Kephisos was diverted into the Orkhomenian plain by Herakles, and that for a time it passed under the mountain and entered the sea, until Herakles blocked up the chasm through the mountain. Classical scholars add the following clues: Herakles rules over Tiryns in Argos at the same time that his cousin (through Perseus) and vengeful taskmaster Eurystheus rules over Mycenae. In his early youth, Linus is Herakles’ legendary music teacher who unfortunately dies at the hand of his unruly young student. This notorious event is dated ca. 1264 by Jerome in his Universal History or Chronicon. So, following Clement’s chronology above, Herakles death and deification occurs a bit less than 38 years later, or somewhere around 1226 BCE. III. Herakles was one of the legendary Argonauts who joined Theseus, Telamon, and Peleus (a few of the many famous fathers of future Trojan War warriors) in Jason’s hearty band of roving sailors. One generation later, the fall of Troy marks the closing act of the Mycenaean civilization. The dating for Herakles deduced by the classical scholars above seems to square pretty solidly with archaeologists’ scientific dating of 1600-1100 BCE for the Mycenaean civilization. Or, more specifically, with 1100 BCE as the date of its demise. Hercules: A Mycenaean Forefather of Hydraulic Engineering? With all his feats of hydraulic engineering detailed in the legends of Hercules, combined with the physical evidence of hydraulic projects dating to Mycenaean times, I feel it’s reasonable to enshrine Hercules as a Forefather of Hydraulic Engineering. How do you feel about this? And now, bolstered with all this exciting mythological context, I hope you will enjoy this well-researched guest post that shines an eye-opening light on the amazing feats of hydraulic engineering still evident from ancient Greece. Here we present selected parts from the very informative paper titled “The Mycenaean drainage works of north Kopais, Greece: a new project incorporating surface surveys, geophysical research and excavation”, by E. Kountouri, N. Petrochilos, N. Liaros, V. Oikonomou, D. Koutsoyiannis, Ν. Mamassis, N. Zarkadoulas, A. Vött, H. Hadler, P. Henning, T. Willershäuser. (Diod. Sic., 4.18.7 “… but in Boeotia he did just the opposite and damming the stream which flowed near the Minyan city of Orchomenos he turned the country into a lake and caused the ruin of that whole region. But what he did in Thessaly was to confer a benefit upon the Greeks, whereas in Boeotia he was exacting punishment from those who dwelt in Minyan territory, because they had enslaved the Thebans ….”). Being located on the crossroads connecting the Peloponnese and Attica to the north of Greece, Boeotia is one of the most important regions of Mycenaean Greece (1600-1100 BC), as borne out by the finds from excavations and its significant place in mythology and ancient traditions. The enormous installation of Gla (e.g. Iakovidis 1983; 1998) built on a natural island in the east creek of the lake is located close to Orchomenos. The citadel was constructed in the early thirteenth century BC by Mycenaeans from Orchomenos, along with the works for the drain of Lake Kopais. It is girt by a Cyclopean enceinte pierced with four gateways; remnants of large buildings, clearly palatial, can still be seen. The constructions on the citadel (Cyclopean wall, residences of officials and granaries) were built contemporaneously. This ensemble has been interpreted as part of an ambitious plan for supervising the drainage installations, as well as collecting and storing the production of the plain. Gla was destroyed in the late 13th century BC. The Boeotian Kephisos River, flowing from northwest to southeast, is discharged at the south-eastern edge of the local basin. Having no outlet to the sea, the concentrating waters of the river formed the Lake Kopais. This body of water either evaporated or drained through several sinkholes in the eastern part of the basin. The basin represents a structural polje of intra-mountainous tectono-karstic depression in a limestone region (Tsodoulos et al. 2008). The polje is well known as a geoarchive for high-resolution palaeoclimatological proxies spanning the period since the mid-Pleistocene (Tzedakis 1999; Griffiths et al. 2002). During the winter, the minimal evaporation coupled by the limited discharge capacity of the sinkholes led to the increase of depth, area and storage of the shallow Lake Kopais. On the contrary, the lake decreased in summer, occasionally in a quite spectacular manner. 20 km2 of the neighboring Levadeia basin, whereas the year 1856 drought led to the complete draining of the lake. Prior to the construction of the 19th century drainage infrastructures, the Boeotian Kephisos emerged from the mountain valley onto Kopais river basin at Pyrgos, NE of Skripou – Petromagoula, joining the Melas river bed. The combined flow was slowly accumulated towards the great sinkholes of Kephalari, south of Topolia village. The Mycenaean drainage works were exactly based on this natural mechanism. Hence, the Mycenaean inhabitants of Orchomenos, in their efforts to secure arable land, must have realized that their main purpose should be to convey the combined discharge of Boeotian Kephisos and Melas away from the Kopais basin, towards the sinkholes to the northeast. The cartographical and topographical surveys conducted by the French and English engineers of the companies that undertook the works to dry up the Lake have brought ground in the study of the Kopais’ basin history (for the previous research in Kopais see Curtius 1892, Kambanis 1892, Kambanis 1893, Kenney 1935; Kahrstedt 1937; Wallace 1979). The impressive remnants of the Mycenaean hydraulic works that were discovered represent the most important land reclamation effort of prehistoric Greek antiquity, reasonably attracting the attention of the international scientific community. Nevertheless, in spite of the minor or extended surveys that followed (e.g. Lauffer 1938/1939; 1939; 1940; 1985; 1986), the picture of the prehistoric drainage works in Kopais had remained ambiguous. The theories (Knauss et al. 1984) that have been proposed concerning the function and the precise date of the works within the Bronze Age, were based solely on indications from surface survey and not on data stemming from archaeological or geophysical research methods. Furthermore, the representation of the operational scheme of the Mycenaean hydraulic works is admittedly a quite difficult task: these works coexist with (i) several subsequent and possibly incomplete attempts to drain the lake over the centuries (e.g. Oliver 1971; Oliver 1989; Boatwright 2000), plus (ii) the existing 19th and 20th century drainage infrastructures. The new interdisciplinary project focusing on the interpretation of the Mycenaean drainage works, is realized by the Hellenic Ministry of Education and Religious Affairs, Culture and Sports in collaboration with the Department of Water Resources and the Environmental Engineering of the National Technical University of Athens (Greece) and the Institute of Geography of the University of Mainz (Germany). The project aspires to answer several queries about the technological background of the inspired technical work in Kopais. Additionally, a series of hydraulic and hydrological analyses attempts to extract the exact operational scheme of the works. The field works, undertaken during the summer of 2011, comprise archaeological surface survey, topographical mapping, geophysical survey, subsurface sampling of soils and three-dimensional terrestrial laser scanning, all combined with exploratory archaeological excavations in selected areas. The results of the first field season provided new evidence on the construction, the course, the size and mainly the dating of the Mycenaean hydraulic works. Starting from the focal point of the segments of the wall excavated by the first author at the site of Anteras, the Mycenaean levee walls were traced and mapped west, towards Orchomenos, for a length of 2.5 km, and east, in the direction of the village Kastro, for 8.5 km. In addition, the Pyrgos, Stroviki, and Tourlogiannis hills were explored for possible auxiliary installations of the Mycenaean hydraulic works, such as guard posts or small forts. At the same time, smaller drainage works and man-made water storage areas postulated by other scholars (Knauss 1984) were sought in the entire aforementioned region. Several initial findings were verified by the preliminary hydrological analysis and the geoarchaeological research. The geo-scientific studies carried out in the Kopais basin by the Institute of Geography of the University of Mainz comprised of vibracoring using an Atlas Copco Cobra mk 1 coring device. The maximum recovery depth reached 7 m below surface with core diameters of 6 and 5 cm. Photo-documentation, description and sampling of the retrieved cores were carried out in the field. Core description included the analyses of grain size, sediment colour, calcium carbonate content and noticeable features such as plant and macrofaunal remains or ceramic fragments. For the geochemical analyses, X-ray fluorescence measurements (XRF) were carried out during fieldwork using a hand-held XRF analyzer [type Thermo Niton Xl3t 900S, calibration mode SOIL]. Measurements were taken every 5 cm, wherever possible, in order to obtain a detailed vertical distribution pattern for the stratigraphical record. Earth Resistivity Tomography [ERT] measurements were carried out at different locations to detect buried segments of the Mycenaean wall and/or sedimentary structures below present ground surface. ERT transects were orientated perpendicular to the assumed course of the levee according to the survey that had been preceded. The position and elevation of the coring sites and the ERT transects were measured (by means of a TOPCON HiperPro FC-250 DGPS device), and the older stratigraphical excavations, can be set forth. First, at the site of Romeiko, around 2.5 km northeast of Orchomenos, one of the two branches of the lower reaches of Boeotian Kephisos River was diverted from its old bed to a new one, shared with the Melas River; the second branch of the Kephisos continued to flow into the western margin of the Kopais basin. This diversion is likely to have been the work of the Mycenaeans. By diverting part of Boeotian Kephisos and Melas Rivers towards the sinkholes existing along the banks of the basin, the water level and the area of the lake were reduced; consequently, the northern portion of the basin could be turned over to cultivation. Second, the diversion was accomplished with the aid of a robust levee, carved in a west-east direction, from the area of Orchomenos towards the sinkholes of the north-eastern cove. The levee ran along the northern edge of the lake, in proximity to the limestone slopes of the basin. It was also setting the boundaries of the region flooded by the waters of Boeotian Kephisos and Melas Rivers, before these were being emptied into the sinkholes. In effect, the levee worked as a barrier and water retention dam at possibly the highest rim of the basin, allowing the land on the other side to be dry for agricultural exploitation. Third, in the portion that was investigated, the levee’s course appears to follow, in parts, the modern country road linking Kastro and Orchomenos, as well as a farm road leading towards the village of Pyrgos. The remains of the levee discovered during the modern widening of the country road between Kastro and Orchomenos, as well as the stratigraphy of the excavations taken place in the site of Anteras, confirm the aforementioned course. Fourth, the constancy of the water supply of the Melas River in yearly terms made it suitable to be used for irrigation and in domestic settlements, without requiring more complicated artificial reservoirs for floodwater retention. Further investigation is needed in order to certify whether the Mycenaean infrastructures included the construction of polders and artificial reservoirs for floodwater retention and storage. Fifth, the exterior sides of the levee are consolidated by strong retaining walls, built in the Cyclopean masonry style. These walls improved the resistance of the levee to the pressure of the water and hindered the erosion of the soil. At the same time, they provided a strong retaining infrastructure for the possible construction of a road along the top of the levee, by the creation of an artificial plateau. The exterior face of the retaining wall is sloped at an angle of 78 degrees; the stones of the lower courses protrude markedly from those of the upper courses. The well-built walls are preserved to a height of 2.30 m, having a width of 1.78 m at the top and 2.78 m at the base. Given the quantity of stones found in the destruction layers, an original height of over 3m can be postulated. The walls were created using large boulders placed in roughly regular courses, with smaller stone chips used as filling. Initially, a foundation trench was dug consisting of a shallow ditch. This was somewhat wider than the retaining wall and it was filled with small stones set into a thick layer of clay. Above this water-proof insulating infrastructure, the stones of the first courses were laid, supplemented by a clay filling in between the joints. The rest of the retaining wall was constructed on top of this course. Unlike the exterior face of the wall, the interior facade was erected vertically, without any particular aesthetic attention; it was filled with uncut boulders protruding and receding at random, and a thick mass of small to medium stones and clay. Sixth, the core of the retaining wall makes extensive use of yellowish clay originating from lake deposits, which is characterized by plasticity and waterproof qualities. A thick and compact layer of this clay, measuring a total of 2 m thick, reaches down to the foundation trench of the retaining wall; the layer was completely devoid of any ceramic material. In a certain case, at the lowest level of this layer of clay, a large stone was found, having fallen from a higher course of the retaining wall. Around it, a small quantity of stone chips indicates that the boulders were roughly hewn on the spot. Seventh, the retaining walls did not have the same dimensions everywhere. These were often dictated by the geomorphology of the area and proximity to the limestone slopes and the sink holes. The total width of the wall at the site of Anteras, including the two Cyclopean segments which marked its northern and southern long sides, measures 30 m.
Eighth, the second retaining wall, on the side facing the dry valley, is often omitted. In these cases, the width of the wall is much smaller. Ninth, a terminus ante quem for the chronological determination of the construction of the retaining wall is provided by the cemetery found at Stroviki. The site is located at a level lower than that of the foundation trench, and dates to the MH period (Aravantinos et al. 2006). In addition, the investigation of undisturbed layers of fill have provided ceramics which clearly place the period of construction and use of the corresponding portions of retaining wall in the LH IIIB period (the middle of the 13th century BC). It is thus confirmed that they belong to the same chronological horizon as that of the citadel at Gla. We continue on the subject by presenting selected parts from the very informative paper titled “Representing the operation of ancient reclamation works at Lake Copais in Greece“, by Mamassis N., S. Moustakas and N. Zarkadoulas. “In ancient times, the civilizations that prospered in the Greek peninsula made a remarkable progress in understanding water-related processes. Also in many cases, they developed integrated systems, which were consisted of large or smaller hydraulic works. These works served the fundamental water needs, such as water supply (for urban use or irrigation), land and urban drainage, flood prevention, sanitary facilities and urban sewage. In the island of Crete, during the Minoan period (3500-1200 BC), a technological step happened regarding water capture, conveyance and utilization. The archaeological investigation in the palaces of Knossos, Phaistos and Malia, which were the center of life for the Minoans, revealed very important hydraulic infrastructures. Systems for water transportation, wastewater and stormwater management and bathrooms with flushing toilets, have been found. Sewage systems as well as bathrooms and bathtubs were also found in the island of Thera the major center of the Cycladic civilization. As ancient societies were developed, the agricultural production became more important. The hydraulic works, which secured crop irrigation, were related to water capture, storage and conveyance. Agricultural lands had to be protected from flooding and in specific cases, new areas were reclaimed by drainage (Koutsoyiannis and Angelakis, 2007; Mariolakos 2009). Considering that Greece had always been an extremely fertile area, therefore suitable for a wide variety of agricultural activity, the importance of such hydraulic works is obvious. Lake Copais, is located in Central Greece, and was partially drained during 13th century BC. A portion of the water volume of the main rivers that fed the lake diverted towards natural karstic sinkholes and finally to the sea. According to Strabo (IX 406-407, 414-415), drainage works were made by Minyans, inhabitants of Copais area during the Mycenaean Period (1550-1150 BC). Historical investigation makes clear that Minyans were very willing to develop commercial relationships with other Greek races, and acquired great wealth and power. However, they focused primarily to control the unique natural resources of their territory and then to develop trade relationships (Kountouri et al, 2013). The works date in the late Mycenaean period, probably around 1400-1300 BC, a period that Minyan civilization reached its peak. Important elements of ancient Copais drainage system came during the construction period of the modern system from the English company ‘Lake Copais Company Limited’. Since then, the Minyan hydraulic works attached the attention of the scientific community. Several studies on ancient Copais drainage system have been carried out by several researchers (Rachet, 1993; Schnitter, 1994; Knauss, 1995; Knauss, 2000). Knauss, 2000, characterized the Minyan works as “extraordinary and ingenious”. He also claimed that the “first hydraulic civilization of Europe” was born in the Mycenaean Copais and suggested that this area was the ‘‘fat province’’ of Boeotia, mentioned by Homer in Iliad, Book 7 (219–224). According to Knauss, 1995, Minyans attempted to gain land from Copais Lake in two main phases. Initially, low but extended earth dams were constructed. These dams enclosed land (polders) used for agricultural and other purposes. After dams’ failure, perhaps due to intense hydrological phenomena, a second system was developed. The most important structure of this second attempt was a 25 km long canal which carried water from Copais basin to the natural sinkholes located in the northeast part of the area. The canal served three main purposes: – It reduced and stabilized the water level of Copais Lake in order to gain land for agricultural use and settlements. In addition, the old protective polders were used again even under extremely wet periods. – It facilitated the water supply of settlements and crops. – It created an inland navigation scheme along the northern part of the basin, facilitating the transport of merchandise from the harbors close to the northeastern edge of Copais, to the major city of Orchomenos. Minyans’ land was the greater area of Copais basin in Boeotia. Although their capital was Orchomenos (at the east of Copais basin), in the early 13th century BC Minyans built a citadel at Gla hill, which was surrounded by cyclopean walls. Gla was a palatial place and it was located at the northeastern part of Copais basin, close to the sinkholes. Remnants of granaries and officials’ residences have been found there. It is assumed that these facilities were used by Minyans to storage the harvest and to supervise Copais’ water management system. – Water cisterns in order to ensure that their irrigation needs will be fulfilled even during dry seasons. – The exterior sides of the levee were reinforced by cyclopean retaining walls. The main purpose of these walls was to prevent, as much as possible, the levee’s erosion. Additionally, they increased its resistance to water pressure. – For the construction of the retaining walls, large boulders were placed externally into layers more or less having the same height, while smaller stone were used inside. The interior of the walls was filled with yellowish clay. This clay was found in large quantities in the former lake bottom, as it was carried by water flow. It is characterized by its high plasticity and waterproofing properties. The above construction technique is similar to the modern way of building earth dams and it demonstrates solid knowledge. Minyans known the materials’ properties and the characteristics of erosion process. – The phases of building a retaining wall was the following: First, the Minyans dug a trench foundation, a little wider than the wall. The trench was filled with a thick layer of clay in which small stones were placed. This structure was waterproof due to the clay. The stones of the first layers were placed above it (with the clay between them as a flange) and the upper layers were constructed on top. – The exterior side of the wall inclined and the boulders of the lower layers were extended more than the higher ones. In contrast, the inner side of the walls was almost vertical. – The proper construction of the retaining walls, allowed them to reach up a height of 2.3 m in some cases, while the stones which were found around them, indicate that their original height was about 3.0 m. Their width varied because of the geomorphology of the surrounding area and the proximity of the walls to the slopes of the basin. – About 6 km east of Orchomenos, the total width of the levee and its two retaining walls was approximately 30 m. Excavations which have been carried out have revealed several positions of the ancient levee. Although it was constructed before 3.000 years, is generally in good condition and still has kept a height over 2 m and a width over 10 m. Nowadays, Copais is a fairly smooth plain without especially acute morphological changes, so the contrast between the flat terrain and the bulky levee is intense. Using aerial photographs and satellite images of Copais, we can find out the traces of the levee to the ground. After a detailed study of the available data, we approximately determined the course of the Minyan levee and we estimated its total length to about 22 km. The drainage system could not entirely be depended on the sinkholes, as the supervision of their condition, especially in their deepest parts, was a difficult task. So Minyans attempted to dig a tunnel in the site of Kephalari, which was very close to the sinkholes. This tunnel was designed to divert water of B. Kephisos and Melas rivers to a small torrent and finally to Euboean Gulf. Its function was similar to the sinkholes and it enhanced the drainage of the basin. Its length was scheduled to be over 2.2 km with a continuous slope of about 1.15% (Kambanis, 1893). It had a cross section of 1.45 m width and 1.55 m height, while its discharge was 7 m3/s approximately. To supervise the construction and operation of the tunnel, 16 vertical shafts were dug with a total depth of about 650 m (Figure 5). Recent exploration revealed that finally, only about one – fifth of the tunnel was completed. In addition, most of 16 shafts never completed and some of them gradually backfilled. The tunnel starts from a sinkhole, continues for about 400 m and suddenly stops (under the shaft 3) to a solid rock. Another proof of the tunnel’s unsuccessful construction found at the bottom of shaft 14, where the tunnel has been dug to both directions for 7 m and stops to solid rock. The ceiling of the tunnel was constructed as a relieving triangle over lintels that distribute the weight into the supporting walls. 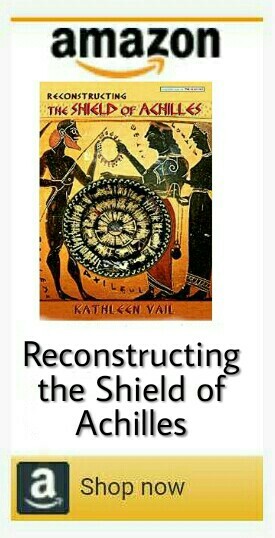 That was a classical Mycenaean technique. Comparing Minyan’s water needs with the combined water volumes of Boeotian Kephisos and Melas rivers we realize that, except from the summer months, the rivers discharges were sufficient for their needs. During summer there was a shortage in water resources and at that period, Minyans could retrieve the water which was stored in the lake in order to irrigate their fields. The Kephisos and Melas rivers flowed in higher levels compared with the cultivated land and the lake water resources were in lower levels. So, it is reasonable to assume that Minyans preferred to use the river flow as it would allow them to irrigate very easily using gravity. Thus, artificial cisterns, which stored small water quantities during winter, could be part of the Minyan water management system. Cisterns provided irrigation water using gravity, during dry summer periods. A possible location of an artificial cistern was found about 6 km east of the city of Orchomenos. At that site, the route of levees unexpectedly curves without any obvious reason (like e.g. terrain morphology). Perhaps this design served the creation of an area where water could be stored in order to be exploited during dry periods. If the slope of the ground was suitable, water could be stored in an area of about 1.5 km2. As the height of the levee was about 3.0 m, approximately 4.5 hm3 of water could be stored in the above location. Moreover, it is possible that this curve also served as the system’s spillway. The most important operational decision that Minyans had to take was the monthly water quantity which had to be diverted from Kephisos and Melas to the sinkholes. This monthly water volume was expressed as a portion of the total monthly discharge of the rivers. – In order to keep the lake Copais under the level of 95m a large amount of water has to be diverted into the sinkhole area. – The operation of the sinkholes includes the control of the accumulated water in order to achieve the maximum exploitation of sinkhole capacity (especially in summer months) but the accumulation volume had to be limited down to100 hm3. – The withdrawal from the lake during the irrigation period is inevitable. That leads to the idea that some small quantities of winter discharges could be stored in small cisterns at the edges of irrigation areas in order to succeed irrigation under gravity. – The need to construct works in order to remove more water from the sinkholes area is obvious. So, clean sinkholes must have been an important task and construction of the tunnel would be necessary. It is obvious that nowadays the geomorphologic characteristics of the Copais lake area are not the same as 3000 years ago. The large amounts of sediments that were transferred during this period must have changed the bottom of the lake. In order to have a gross estimation of this parameter, a calculation of sediment transport was performed. We estimated the sediment transport using a formula developed for Greek basins (Koutsoyiannis and Tarla, 1987), which takes into account the precipitation regime and the geological formation of the area. A value of 500 t/km2 was calculated for the area and we considered that about 1000 km2 of the higher part of the basin were eroded. So a total volume of about 1500 *106 t of sediments must have been transported to the lower areas of the basin during the 3000 years period. The average sediment density was considered 1.2 t/m3, so the total volume of the sediments is estimated to be 1250 hm3. This volume covered the lower parts of the basin, including Lake Copais an area that is estimated to be 900 km2. If the sediments distributed equally over the lowlands area an average increase of 1.4 m to the altitude after 3000 years is reasonable. The lake is located at a distance from the rivers and the sediments mainly deposited to the upper Kephisos basin, so we suppose that the lake area 3000 years ago was about 1 m lower than today. The key challenge for the Minyans was to secure the cultivation of flood plains above 97m and to reclaim the areas between 94-97 m. The area between 97 and 100 m is about 40 km2 and the reclaimed area between 94-97 m is about 63 km2. Therefore, the total area available for cultivation is estimated to be more than 100 km2. To reclaim land from Copais Lake, Minyans constructed the levee in order to divert huge amounts of river discharges into the sinkholes’ area. The results of the hydrological simulation prove the difficulty of the complete drainage of the lake. Although during long periods of hydrological drought the lake recessed significantly, it rarely drained totally. On the other hand, it is possible that during long wet periods some areas around 94-95 m were temporarily flooded. This result is compatible with the works of Rachet (1993) and Schnitter (1994). Both studies come to the conclusion that Lake Copais had never been completely drained by the Minyans. Minyans continuously struggled to keep water level of both lakes as low as possible. The main operational decision was the amount of water, which had to be diverted towards the sinkholes. According to previous operational cases, operational rules that could achieve this task might have been applied. Additionally, Minyans could change the operational rules in specific time periods in order to improve the performance of the system. An important factor of the system performance was the capacity of the sinkholes which is strongly relevant to the accumulation of water towards the sinkholes’ area. Also, the permanently reclaimed areas were analogous to the sinkhole capacity. It was the reason why the Minyans (or their descendants) made efforts not only to clean regularly the sinkholes but also to increase the amount of water that could be extracted from the hydrosystem. To complete that task they constructed the tunnel at Kefalari. Oh my goodness you have been working hard at this research Kathleen. It’s brilliant !! Only last week we were watching the film Hercules, but of course it was not this detailed. Hope all is well with you. Excellent work Mrs Vail! We definetly agree that the ancient myth(s) must have had a core of truth in it. Thanks, Dear Friend – Your research is wonderful and it’s a pleasure to share your work! Salowey, C.A. 1994. “Herakles and the Waterworks: Mycenaean Dams, Classical Fountains, Roman Aqueducts.” In K.A. Sheedy (ed. ), Archaeology in the Peloponnese: New Excavations and Research, 77-94. Oxford: Oxbow Books. MYCENAEAN CIVILIZATION: A RESEARCH GUIDE – The section on Tradition and Historical Evidence (pg 116) covers this topic and references Salowey’s work (among others). Thanks again!